One of the great benefits available to those who teach music is the opportunity to receive great, free recordings from the service bands. They offer these cds as educational and recruiting material. 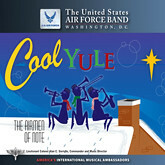 Last month I received The United States Air Force Airmen of Note's "Cool Yule" cd. It is absolutely fantastic. The musical arrangements played on the cd are witty, fun, and swinging! The album opens with "Jing, Jing, Jing", a combination of Benny Goodman's "Sing, Sing, Sing" and the traditional "Jingle Bells". Also included is "Santanooga Choo Choo" (Chatanoogo Choo Choo/Santa Claus Is Coming To Town), "Faithful In Paris" (April In Paris/O Come All Ye Faithful), and many more. My favorite is their version of "Up On The Housetop". It is done with Stan Kenton's "Peanut Vendor" in mind. I have played this cd for my students, for friends at my gigs at Giuseppe's Ristorante Italiano and Caproni's Restaurant, and for the school band directors I visit each week. Everyone loves it.